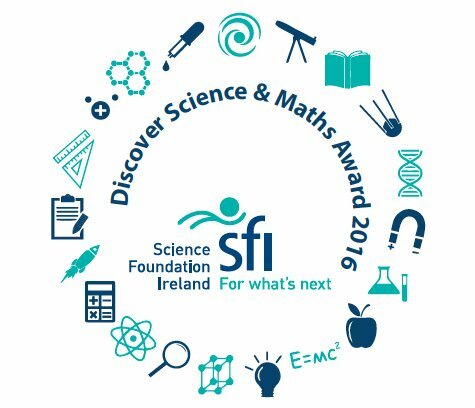 Tá muid ag cleachtadh an t-amhrán náisiúnta do Lá an Fhorógra , Dé Máirt, an 15 Márta 2016. 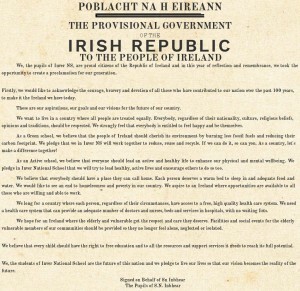 Ceapann ár múinteoirí go bhfuil muid thar bharr! 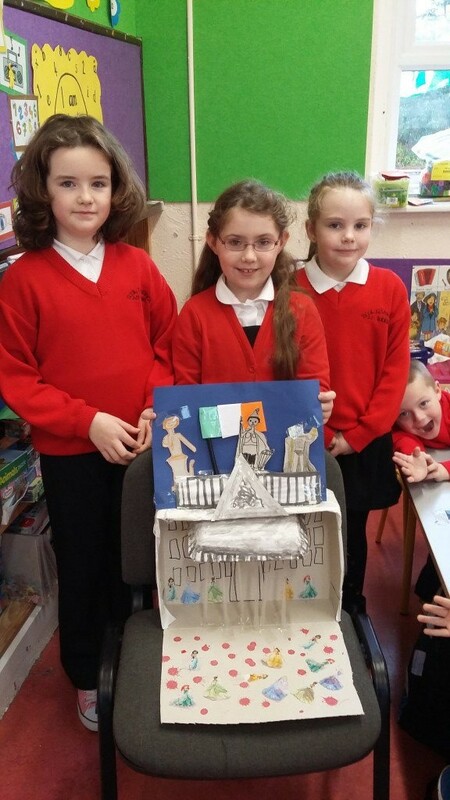 Here are Eve, Aoibhe and Lucy with their wonderful replica of the GPO which they created while studying the 1916 rising. Great job guys! Well done! 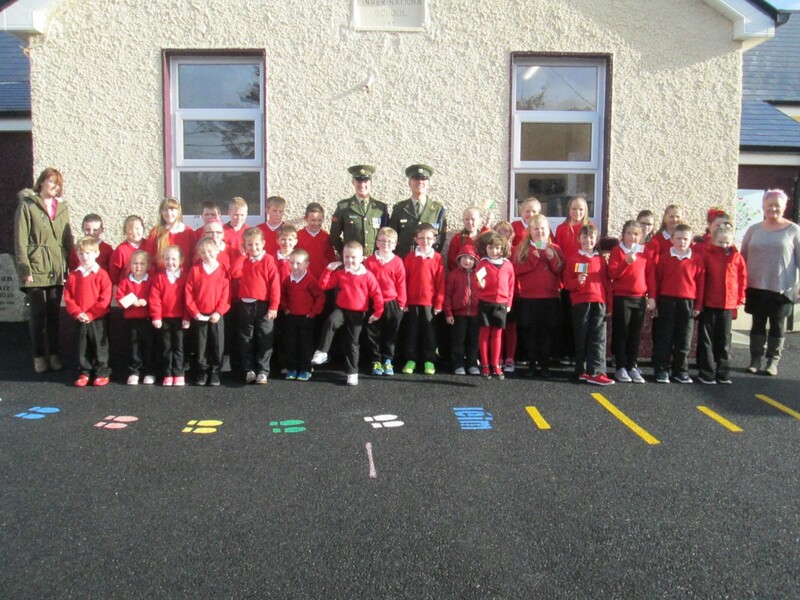 On Wednesday soldiers from the Irish Defense forces came in to us to give us the national flag. It was good fun👍. Their names were Des and PJ .There was lots of work in this. 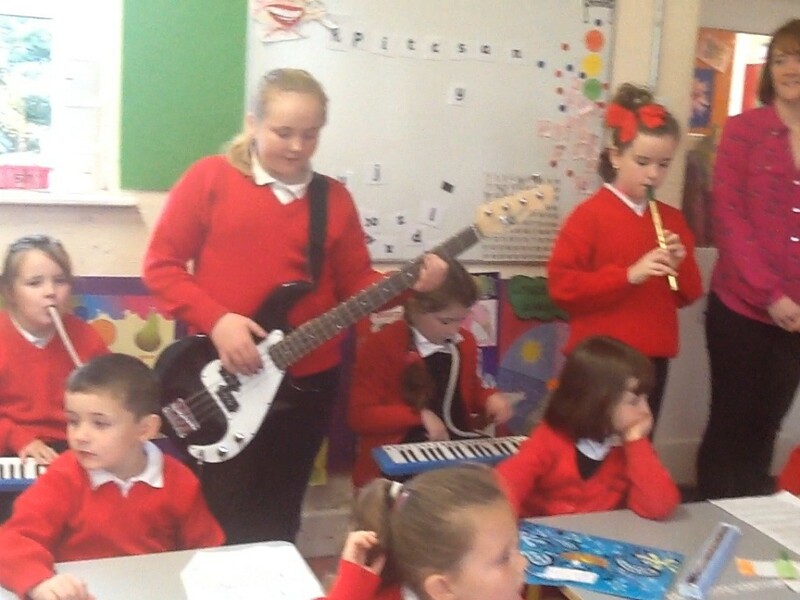 We had to learn the national anthem and to learn the proclamation as well as play a marching tune on our instruments. First we looked at the flag. Then Des told us about the rules of the flag. One of them was about not writing on the flag and another was not to wear it like coat. Lucy was the person to received the flag on our behalf . Then we talked about our flag and how we got our flag. 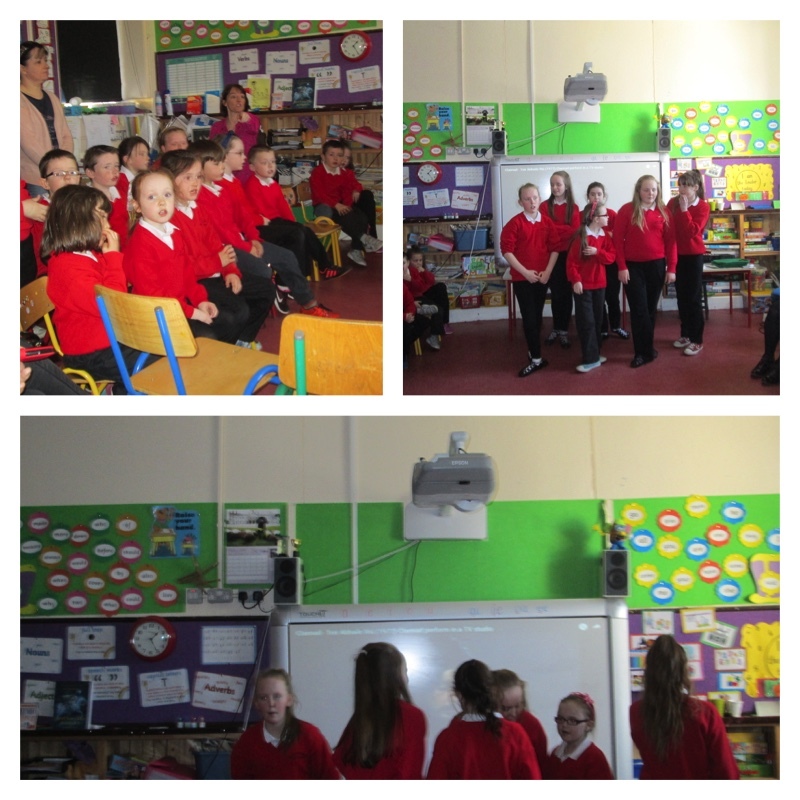 Then we asked a few questions and they answered all of them. Then we took some photographs. 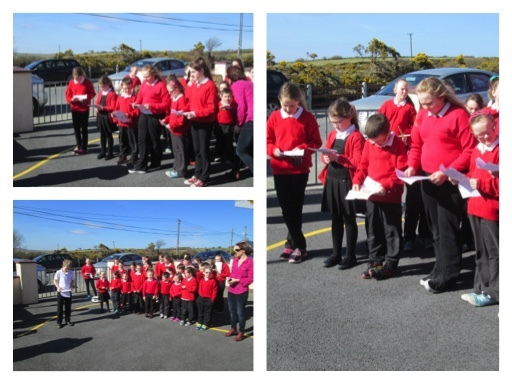 When they came in first we played our tune called Fáinne Geall An Lae which is a marching tune. 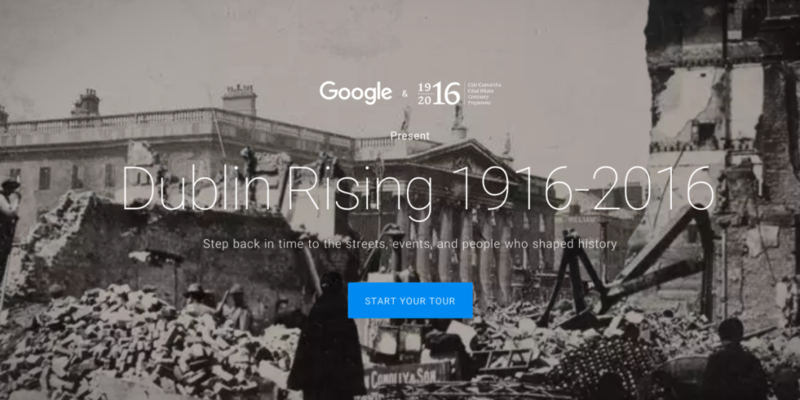 Then they talked a little bit about the 1916 rising. 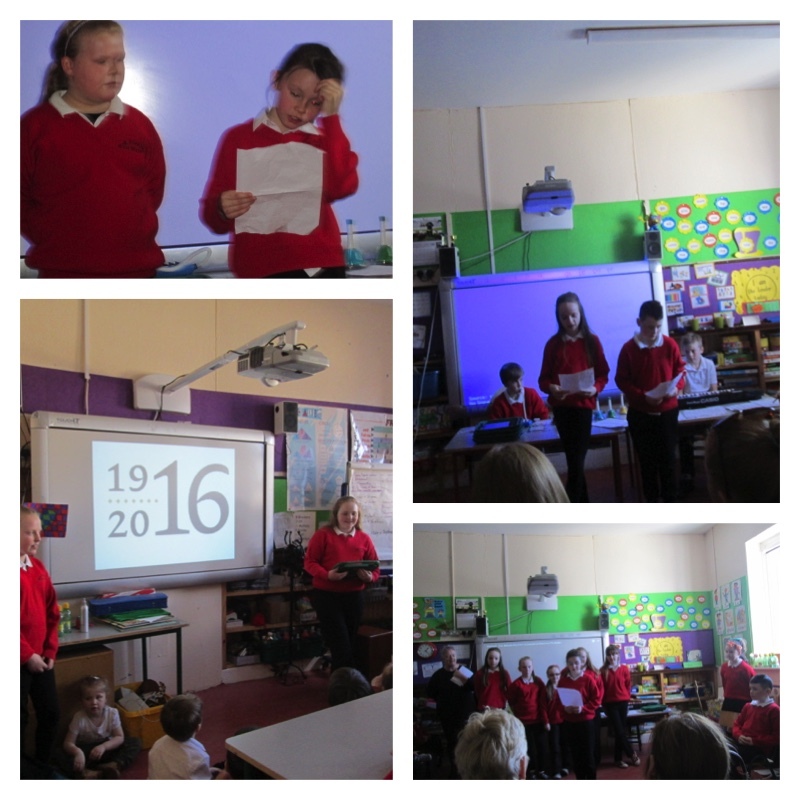 After they talked about 1916 we sang The National Anthem. I think they really enjoyed it. 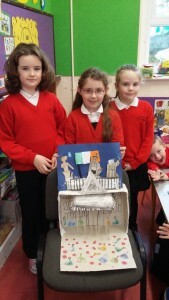 They presented the National flag to Lucy and a book about 1916. They told us that this flag can’t touch the ground or be around you like a cape. It had to be raised on the highest flag pole for everyone can see it. Everyone took a picture of Lucy and the solders. Then we went outside to take a picture with them and the whole entire school. I really hope they come again.😄. 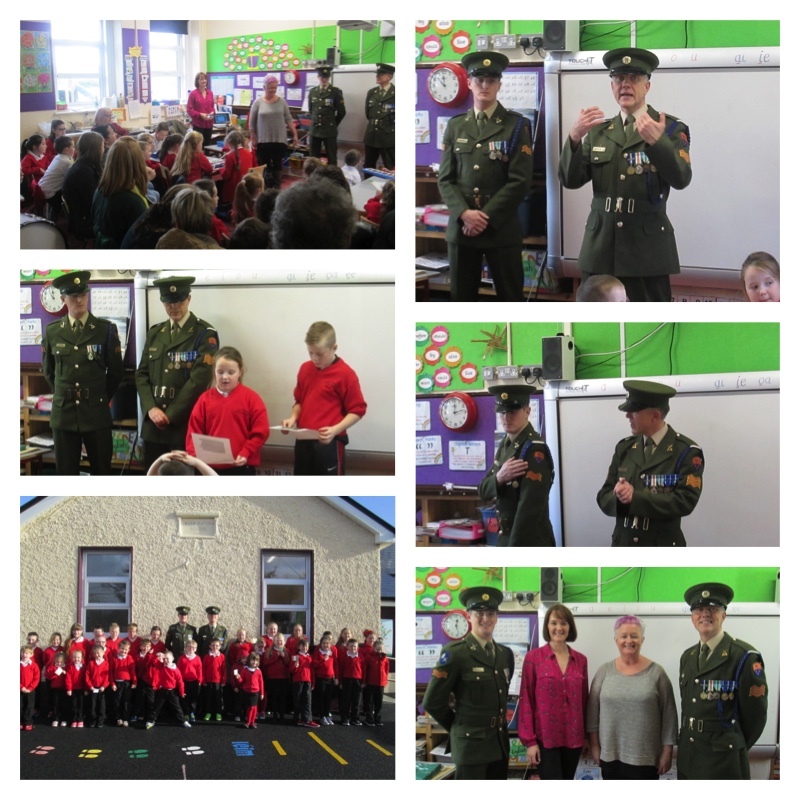 Ogalaí na h-Eireann’s Corporal Des Padden and my uncle Sergeant PJ Maloney came to our school. 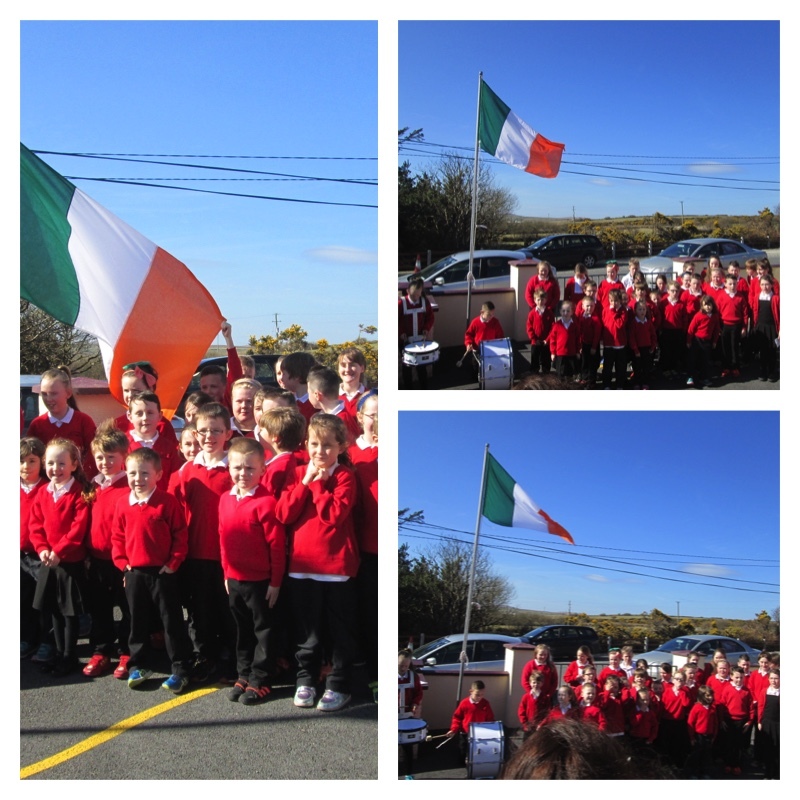 They gave us a flag which my school and all of the other schools in Ireland will raise on the 15th of March 2016. We must respect the flag and raise it and lower it every day to remember all of those who have lived and passed in the 1916 Rising and also remember those who died in 1916. The men talked about their uniforms. PJ has three stripes on his arm because he is a Sergeant. Des has only two because he is a lower rank then PJ (Des is a Corporal). PJ has a pin on his shirt because he is a fluent Irish speaker. Des doesn’t have one but he is learning. Des has three medals and PJ has five medals.